Time-tracking has been on our to-do list since the dawn of time. Not all freelancers track time, but those who do prefer several different ways of tracking time. Some people need the accuracy of a timer while others simply need to tally hours at the end of the day. We wanted to cater to each type, but also retain the simplicity and friendliness of Cushion’s design. After several months in private beta, we’re now opening up the time-tracking beta to everyone. Cushion’s new time-tracking section has several different views, including a day view, week view, and report view. In the day view, you can focus on a single day and draw your time. We’re now taking an “inline” approach to everything in Cushion, so instead of navigating away from the page, time entries can be added by directly interacting with the graph. You can bet we’re planning to spread this inline approach to the rest of the app. In the week view, you can add hours to each day without worrying about start/end times. This view is perfect for freelancers who take a more laid-back approach to tracking their time. For those who need a stopwatch, Cushion’s timer is as simple as it gets. Start a timer for an existing client, project, or existing entry. If you need to take a short break, you can pause the timer, then continue when you’re ready to get back to work. 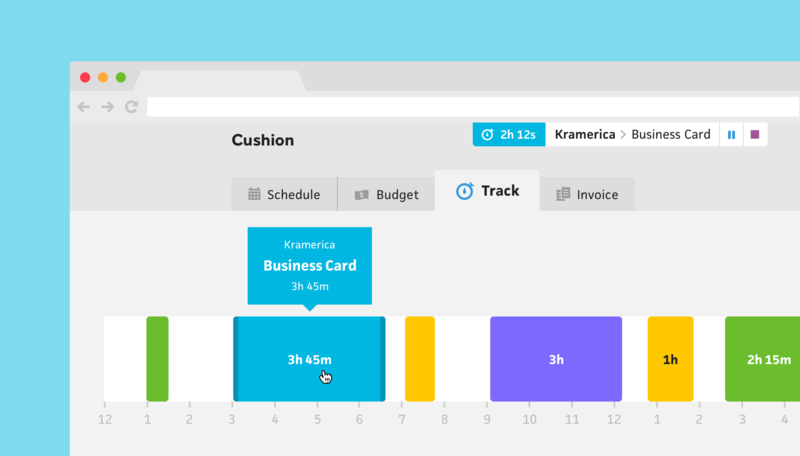 Cushion also has realtime reports, so you can visualize your tracked time for the month, quarter, or year. When you’re ready to bill the client, simply import your time into an invoice—grouped by date, project, or description. Even though this initial beta has a ton of useful features, we have so much more planned for time-tracking in Cushion. If you’re interested in beta testing it, go to the Add-Ons section of the app and enable the beta.